A selection of customer testimonials and feedback. For a company that has been established in the industry for over 30 years and has over two thousand loyal customers, we could say a lot about ourselves and the high level of service we've been providing since 1982. So have a read through some of our testimonials below to find out what our customers are saying, in their own words. I have to say it is so nice to have someone like Zepbrook supplying the service they said they would, without any fuss or bother. The servicing of the machines happens at the specified intervals without me having to chase, and the deliveries of drinks, glasses etc all happen without problem. On behalf of myself and James Higgs I wanted to thank you and Adam for all of your help and excellent service leading up to the London Triathlon. The event went very well, and we have had lots of positive feedback following the weekend. It has been a pleasure working with you and thank you again. I have used other suppliers for wines, coffees and nuts but my colleague Runnee has only been saying good things about Zepbrook and people that work for the company. Could you please kindly send either a PDF version or the product catalogue over to me so I could start shopping with you guys. Appreciate the next day delivery service & prompt attention of yourself & your team. Your service last year was excellent. I’d like to make a particular mention of your delivery driver, who I have always found to be cheerful, professional and friendly. You and the team are very good at what you do, happy to recommend. We just wanted to drop you a quick email to give you some feedback on your driver (Dave). Dave has been a regular for us for 3 years. We are always really happy to see him arrive as he is an absolute character and really makes us all smile. He is always on time and always willing to go the extra mile when requested which in our opinion is very rare. He takes absolute care with all the products and always makes us completely aware of missing items. 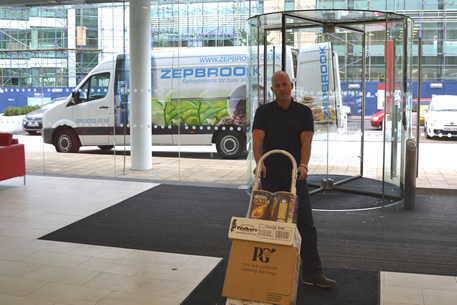 The fact he is concise and to the point with everything makes us at ease with ordering from Zepbrook as a company, we deal with a lot of services to manage the office and to know we can 100% trust what is coming and going without worry makes a big difference to our business as usual. The service is wonderful at Zepbrook! Never change the team…. They are worth their weight in gold. Thank you for the specials. We are very happy with the services from yourself and the feedback from our post room and receptionist is that the delivery guys we receive are fantastic. The service was absolutely fantastic and the person who delivered our goods was such a lovely, helpful gentlemen! Always's pleased when Zepbrook delivery arrives, your polite and courteous delivery drivers are the nicest guys. And are always incredibly helpful when putting away the water and assorted drinks. Above & Beyond! Border Biscuits recommended us to Zepbrook. The office is very happy. The biscuits are delicious and fresh and crisp. I think your delivery service is great – the biscuits didn't arrive broken – we have had a big problem with this with another supplier which is why we were looking for a new supplier and came across Zepbrook.